It all comes down to one game -and on Ki Sung-Yeung’s birthday: the aggregate winner of the 2nd leg in the Capital Cup semifinal between Swansea and Chelsea will go on to the final game at Wembley and presumably qualify for the Europa League next season. Why this certainty that today’s winner will already predictably go on to win the finals at Wembley? Does the Tavern possess new powers of clairvoyance? Not quite. Instead, 4th tier Bradford completed their absolute humiliation of Aston Villa yesterday, losing 2-1 but winning 4-3 on aggregate to be the first lower tiered side from that division since 1968 to qualify for the league cup finals. That’s who today’s winner will be facing -and there won’t a bookie anywhere on the planet who’ll stake odds that Bradford can do one better than what they’ve done so far: by beating Wigan, Arsenal and Aston Villa to get to this stage at Wembley in late February for this final occasion. So for all intent and purpose, today’s game is the finals. But I digress, the game is about to commence: Ki is part of the starting lineup. This is by far one of the biggest games Ki has been involved with in a Swans uniform. SWANS starting XI: Tremmel, Rangel, Williams, Chico, Davies, Britton, de Guzman, Ki, Routledge, Hernandez, Michu. Chelsea starting XI:CHELSEA: Cech, Ivanovic, Cahill, Cesar, Cole, Ramires, Lampard, Mata, Oscar, Hazard, Demba Ba. The Swans have never gotten this far deep into this tournament. They already lead 2-0 in aggregate thanks to defensive lapses by Chelsea’s Ivanovic from the 1st leg of the semifinal. We’ll be updating when we can. Halftime update: Swans 0 Chelsea 0. Other than a few good goalscoring chances by the Swans, Chelsea’s been pressing in the Swans half for a good portion of the game thus far. Numerous chances, but no goals and Chelsea is still searching for that breakthrough. Ki for his part in the first half is in his usual good game form. Initially playing deep in the midfield, he surprised Chelsea in the 9th minute with an aggressive series of give and goes, with Ki getting into a dangerous position on the right flank. He was ruled offsides and the play fizzled out. From the central midfield, Ki’s ‘Superman-like’ vision allowed him to deliver one killer long ball pass after another, finding his target men and kept Chelsea’s defense on their toes with those sudden counterattacks. He did get a nasty tackle from behind by Ramirez; a dangerous challenge that hurt his ankles. He was down writhing in pain for a good part of 3 minutes before hobbling off the pitch. Incredibly, the officials never saw it and Ramirez escaped what was surely a yellow card. 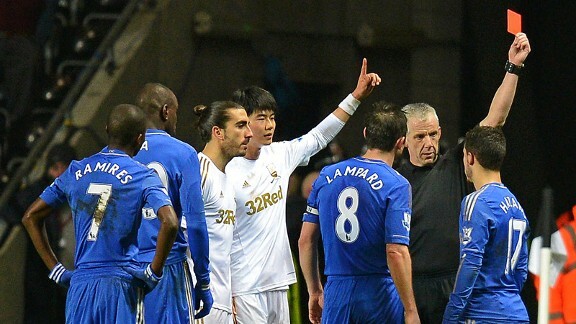 The Swans were down to 10 men, but only for less than a minute before Ki came back, albiet slightly slower. Ki was responsible for 2 bad passes, but as soon as I can find my Tavern statistician, I’ll be able to verify that Ki still possesses an impressive pass rating so far today. UPDATE: WHOA! Tomorrow’s headline might be on Chelsea’s red carded blunder, kicking a ball boy !?!!! Honestly, who kicks a ball boy? Eden Hazard it turns out. Nevertheless, good Swansea defending and a few Ki chances at scoring a goal capped off a remarkable league Cup semifinal win. No score today in this 2nd leg, but with a 2-0 aggregate score, Ki Sung-Yeung and Swansea march on into Wembley Stadium for the finals on Feb 24. Against 4th division Bradford – a team that not only were giant killers in beating Wigan, Arsenal and Aston Villa, but are somehow a mere 9th in their own minnow division… Can the Tavern go ahead and predict a Ki goal in this match? We’ll have more on the game, and as promised some updates on transfer news but the Tavern’s got to get dinner started for the family. See everyone later – hopefully tonight!